The historic marker in Gordon Park at 12th St. and Clairmount. 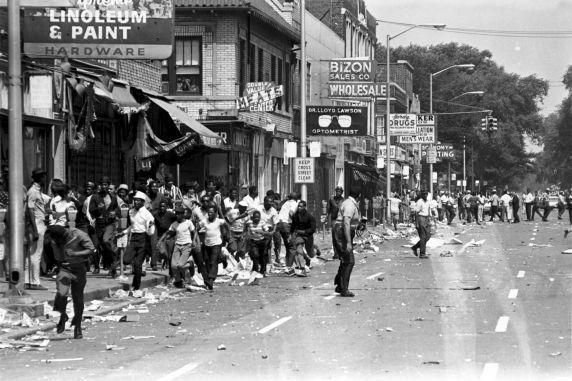 On July 23, 1967, a police raid on an illegal after-hours bar at Twelfth and Clairmount streets sparked five days of catastrophic looting, arson, and violence that left 43 dead. That nightlife spot and most other commercial buildings on this once-thriving strip are now gone. 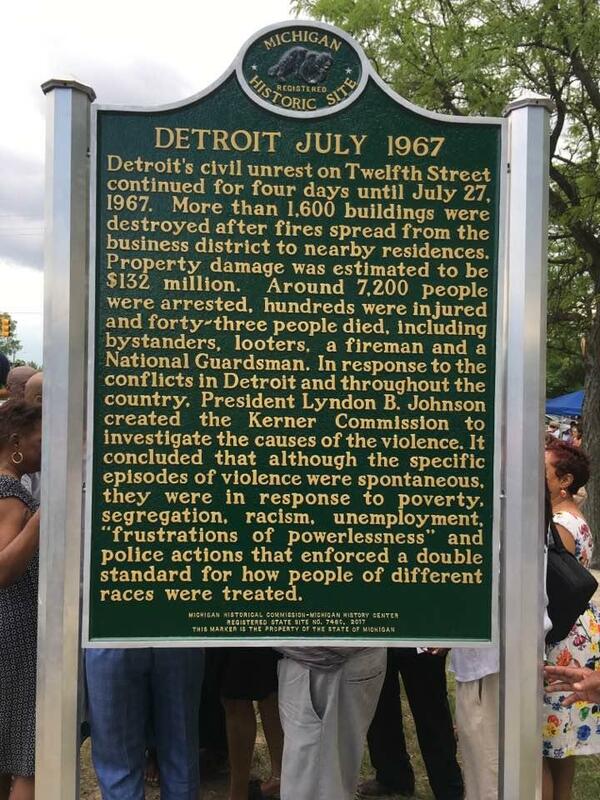 But the state historic marker simply titled “Detroit July 1967” now stands in Gordon Park at 12th and Clairmount. Dignitaries including Detroit Mayor Duggan and Congressman John Conyers joined community members at an unveiling Sunday afternoon. It was part of three days of events in the area commemorating the 50th anniversary of the unrest, which combined somber remembrance with a sense that the neighborhood is finally on the brink of renewal. “We all know what happened 50 years ago,” said community activist Lamont Causey, whose family has 70-year roots in the neighborhood. He said too many longtime residents, including two uncles arrested during the riots, didn’t live to share their stories on this anniversary. The state historic designation grew out of the Detroit Historical Society’s Detroit 67 Project, a years-long effort to build community relationships around the lasting impacts of the unrest. 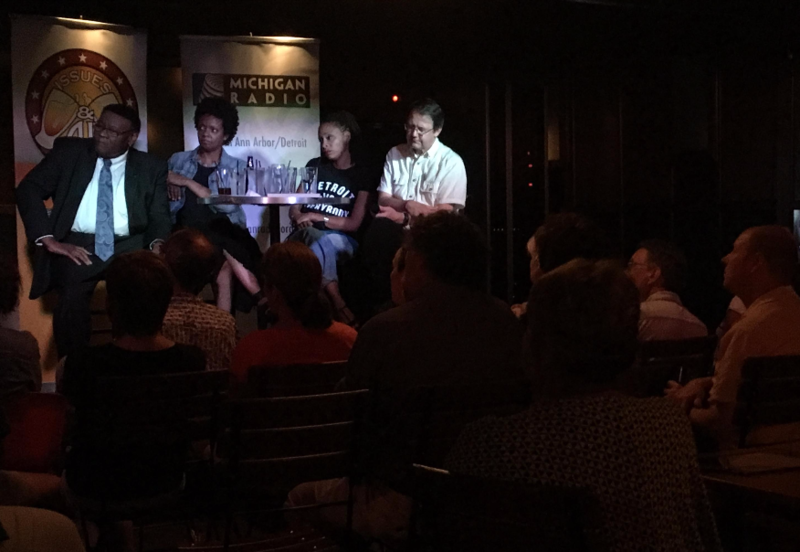 Detroit 67 Project director Marlowe Stoudamire said the goal is not to “move past what happened, but move the conversation forward,” and take a fresh look at the many unresolved issues behind the 1967 uprising. The historic marker gives a brief summary of the riot’s lasting damage, including 43 deaths. 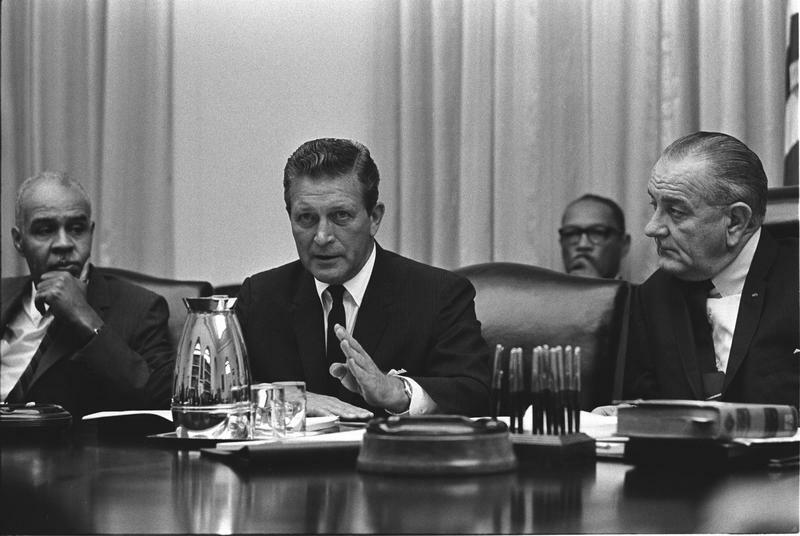 It also quotes from the historic 1968 Kerner Commission report. It concluded that Detroit’s unrest, like other disturbances that swept cities that summer, were spontaneous in nature. But they were also expressions of “frustrations of powerlessness” in response to poverty, racism, unemployment, and police mistreatment of African Americans. Elements of that frustration remain. Mayor Mike Duggan’s speech was interrupted by a small group of hecklers angry about policies that have led to mass foreclosures and water shutoffs. While most in Sunday’s crowd cheered on Duggan, there are underlying anxieties about how Detroit’s spotty revival will treat its most vulnerable residents. Cast members from the upcoming move "Detroit," based on an incident that took place during the July 1967 unrest, pose with a Detroit police officer in Gordon Park. But many longtime residents say there’s a sense of tentative optimism they haven’t felt for a half-century. 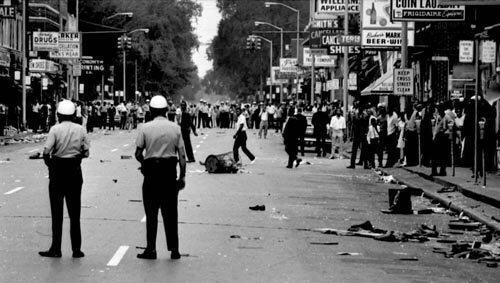 And with heightened global interest in Detroit’s unfolding story, there’s wider interest in examining the legacy of July 1967. 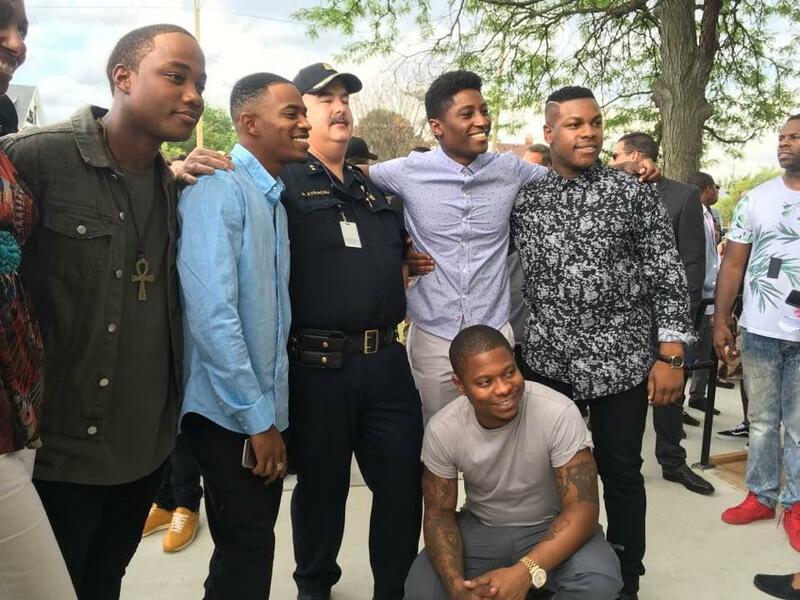 Cast members from the upcoming movie Detroit also made an appearance at Gordon Park Sunday. The film depicts one of the riot’s most disturbing episodes: how Detroit police terrorized a group of young people at the Algiers Motel, resulting in the deaths of three black teens. It premieres at Detroit’s Fox Theater this week, before nationwide release August 4th.